I have just moved to the University of California at Irvine as an Assistant Professor. This page will be updated and moved to their servers soon. I retain a visiting professor position at the Pontificia Universidad Católica de Chile. I am a professor at the Physics Faculty of the Catholic University of Chile. My research interests lie in the area of experimental particle physics, the branch of science that studies our universe at the smallest and most fundamental level. 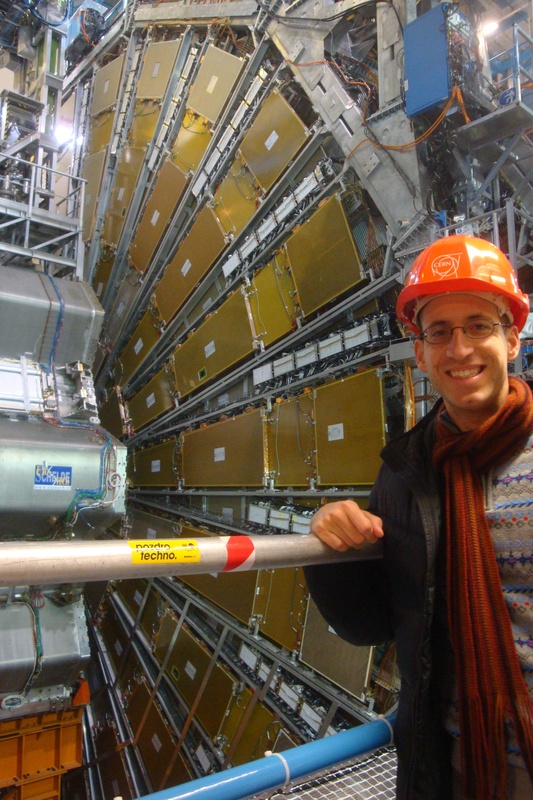 I am a collaborator in the ATLAS Experiment at the European Center of Nuclear Research (CERN). With ATLAS we can study high-energy proton-proton collisions from the Large Hadron Collider (LHC), the world's largest and most powerful accelerator. By taking matter to extreme conditions never before recreated in the laboratory, we are able to learn volumes about many open questions in physics such as the origin of mass and the unification of the fundamental forces. We are also able to search for exotic phenomena such as extra dimensions of space, microscopic black holes, and dark matter particles. Our Atlas Andino group is involved in many aspects of the experiment, including the acquisition and analysis of collision data. We also perform the last stage of construction and the cosmic-ray testing of the next generation Thin Gap Chambers (the modules seen in the background of the picture on the right) in our local laboratories. These modules will be installed in the ATLAS New Small Wheel in 2019. I am also heavily involved in the Daya Bay Reactor Neutrino Experiment, located roughly 50km northeast of Hong Kong, in China. In this experiment 8 identical detectors, each weighing more than 100 tons, are deployed in 3 underground caverns at different distances from a group of 6 nuclear reactors. 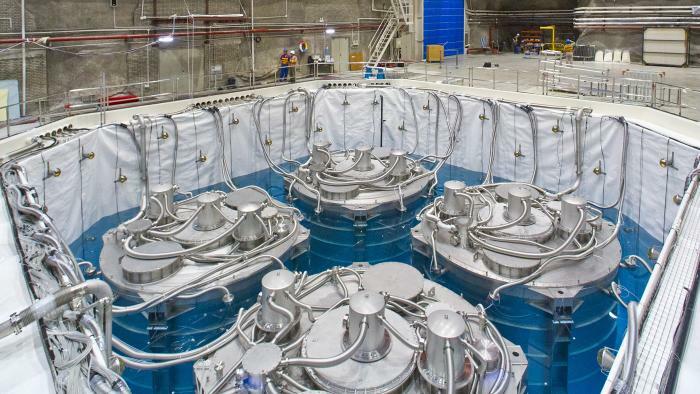 The detectors are immersed in very large pools of water in order to shield them from ambient radioactivity and to be able to detect incoming cosmic-rays (see picture on the right). This allow us to study the mysterious properties of neutrinos, the fundamental particles copiously produced inside nuclear reactors, and thus to shed light on the nature of our universe and the forces that shape it. Our local group in Chile is heavily involved in many aspects of the experiment, such as calibration, reconstruction, data analysis and the search for new physics. I also have the privilege of serving the collaboration in various leadership positions. You can learn more about Daya Bay here and here. You can also see an article that appeared in the University's website here (in spanish). a 300 million dollar project with an extremely rich program in neutrino physics and astrophysics. 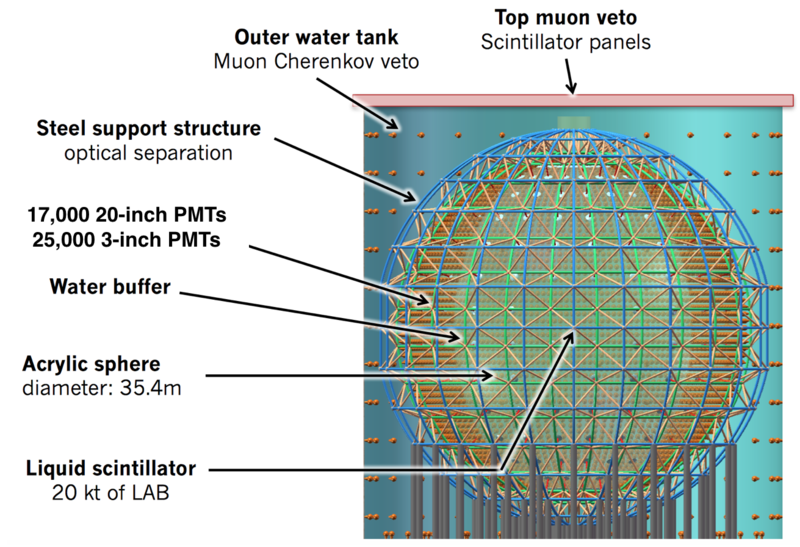 With a 35m diameter acrylic sphere of liquid scintillator surrounded by over 35,000 photomultiplier tubes (PMTs) of different sizes, JUNO will be the largest and most precise detector of this type ever built in history. Our group in Chile is responsible for various components of the small (3 inch) PMT subsystem, which I co-manage. This includes the underwater boxes that will house the electronics, as well as the high-voltage divider boards for the 25,000 channels. We are also contributing to the design and construction of the underwater connectors that will link the PMTs to the electronics. Please see this article for more information on the funds that we got from CONICYT for these activities. The project is advancing rapidly, and we expect to begin data-taking by 2020.